This document lists specifications for the PXIe-2514 ( PXIe-2514) fault insertion unit (FIU) switch module. All specifications are subject to change without notice. Visit ni.com/manuals for the most current specifications. Refer to the NI Switches Help for detailed topology information. The protection provided by the PXIe-2514 can be impaired if it is used in a manner not described in this document. Typical specifications are specifications met by the majority of the instruments under the stated operating conditions. Typical specifications are not warranted. Data provided in this document are specifications unless otherwise noted. All input characteristics are DC, ACrms, or a combination unless otherwise specified. Steady state voltages applied to the NI 2514 between any two I/O connector pins in excess of the maximum switching voltage specification may damage this module. This module is rated for Measurement Category I and intended to carry signal voltages no greater than19.8 Vrms/28 Vpk/28 VDC. Do not use this module for connection to signals or for measurements within Categories II, III, or IV. Do not connect to MAINs supply circuits (for example, wall outlets) of 115 or 230 VAC. Signal connections through the PXIe-2514 are intended to go through the DUTn pin connections. Signal paths that do not use the DUTn pin connections may exceed the module’s thermal capabilities. 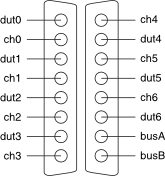 Refer to the connector pinout in the Diagrams section of this document for DUTn pin connections. The maximum switching power is limited by the maximum switching current and the maximum voltage, and must not exceed 1,120 W.
Use the following equation to determine the Maximum Possible Pulse Width (seconds) for a given Maximum Inrush Current “peak” amplitude (Amps) and Steady State Current (Amps). After a switch operation, an overcurrent error condition occurs when both the overcurrent limit of the module is exceeded, and the overcurrent delay time has expired. To help protect against fault conditions, the PXIe-2514 incorporates circuitry to detect overtemperature conditions. Exceeding the module’s thermal limit induces an overtemperature condition. Overtemperature conditions are created when excessive power is dissipated in the channel paths such as when switching large impulses created by switching into capacitive or inductive loads or when switching a signal at a higher rate than the module dissipates the generated heat. Refer to the figures below for information about the maximum cycle rate. 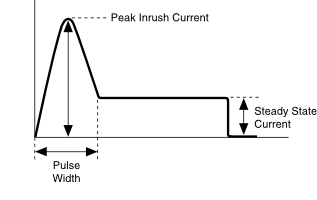 The Switching Current Waveform graph indicates where on the inrush waveform you can find the parameters necessary for determining maximum cycle rate. Complete the following steps and use the figures above to determine the maximum cycle rate at which a channel can be switched when the peak impulse current value and duration are known. Using the Maximum Cycle Rate graph, choose the graph line that meets or exceeds the peak inrush current value of the signal being switched. Find the point on the trace that equates to the steady state current being switched by the load. 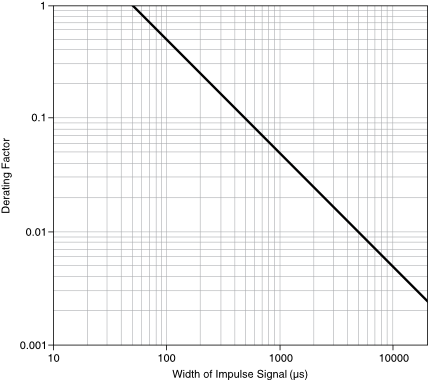 Find the corresponding intersection on the y-axis which indicates the maximum cycle rate allowed for a signal with a 50 μs maximum inrush pulse duration. Find the point on the Maximum Cycle Rate Derating Factor by Pulse Width graph that corresponds to the measured pulse width of the inrush current pulse. Find the corresponding derating factor. 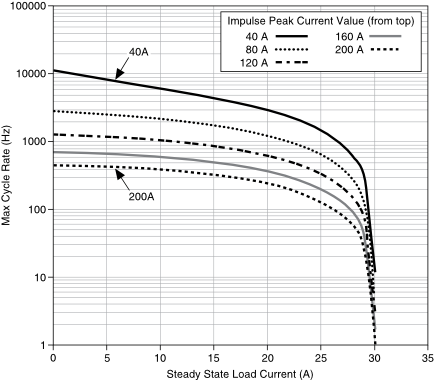 If the peak impulse current does not exceed 40 A, do not derate the maximum cycle rate below 31 Hz. 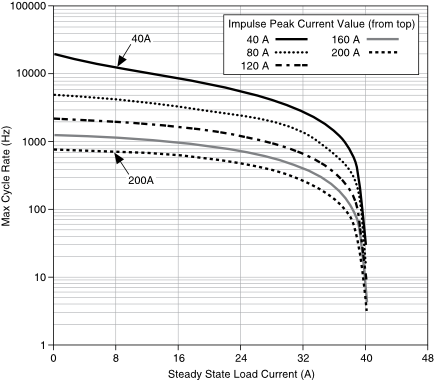 For switching a steady state current of 4 A into a load with peak inrush current of 180 A that lasts for 400 μs, choose the 200 A graph line in the Maximum Cycle Rate graph. Find the y-axis value that corresponds to the 16 A load current (650 Hz). Then find the derating factor in the Maximum Cycle Rate Derating Factor by Pulse Width graph that corresponds to 400 μs (0.1). For switching a steady state current of 15 A into a load with peak inrush current of 180 A that lasts for 400 μs while another channel is also carrying 25 A, choose the 200 A graph line in the Maximum Cycle Rate for Multiple Paths Closed graph. Find the y-axis value that corresponds to the 15 A load current (300 Hz.) Then find the derating factor in the Maximum Cycle Rate Derating Factor by Pulse Width graph that corresponds to 400 μs (0.1). The PXIe-2514 can recognize trigger pulse widths less than 150 ns if you disable digital filtering. Refer to the NI Switches Help at ni.com/manuals for information about disabling digital filtering. The following figure shows the PXIe-2514 power-on state. The following figure shows the PXIe-2514 connector pinout. Visit ni.com for more information about the following accessories. You must install mating connectors according to local safety codes and standards and according to the specifications provided by the manufacturer. You are responsible for verifying the safety compliance of third-party connectors and their usage according to the relevant standard(s), including UL and CSA in North America and IEC and VDE in Europe.